As is our practice after wrapping a series, here are our recommendations — and disrecommendations — of the DS9 episodes we didn’t think were tapestry worthy. Given the serial nature of DS9, we’ve grouped some episodes together. “Duet” — The best episode that gets to the core of the lingering Bajoran/Cardassian problems immediately after the occupation. Nana Visitor is at her absolute finest and the series — after some unevenness in season one — starts to show its potential. “The Circle” trilogy — A truly great start to DS9’s second season. It would have made the tapestry if Bajoran politics hadn’t been so marginalized for the rest of the series. “Necessary Evil” — Classic DS9 with a look back on the station before “Emissary”. “Defiant” — Jonathan Frakes plays Will Riker’s evil transporter duplicate who steals the Defiant for the Maquis. It’s a great one-off episode written in typical Ronald D. Moore style. “Through the Looking Glass”/”Shattered Mirror” — The two mirror-universe follow ups to the great “Crossover”. “Looking Glass” is pretty good and “Shattered Mirror”, while goofy and implausible, is fun. Avoid the next two mirror episodes — the boring “Resurrection” and the regrettable “The Emperor’s New Cloak”. 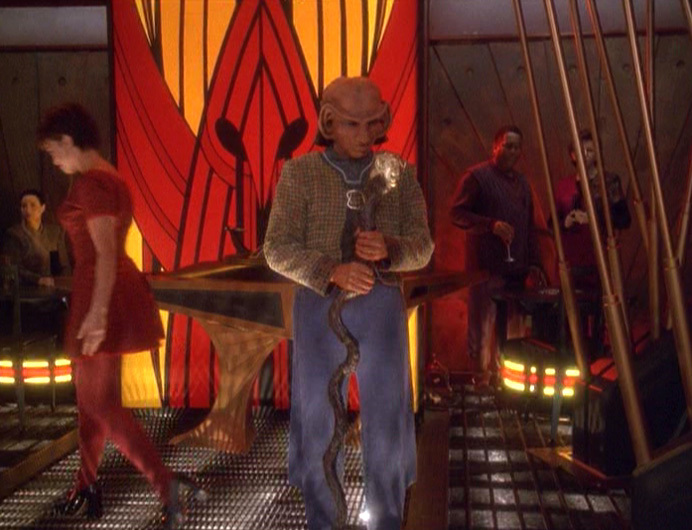 “The Visitor” — Without question, DS9’s best episode. Incredibly poignant and moving. It all gets undone in a time travel thingy, which is why it didn’t make the tapestry. 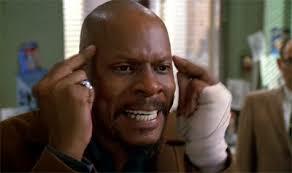 But as much as we’ve criticized Avery Brooks on this site, he’s great here. “Little Green Men” — The best of the Ferengi episodes (with only “The Magnificent Ferengi” and maybe “Business as Usual” coming close). Genuinely amusing and well acted by the three lead Ferengi characters. “… Nor the Battle to the Strong” — The best use of Cirroc Lofton as Jake, as Tony Todd played old Jake in “The Visitor”. Simply a great war-time episode. 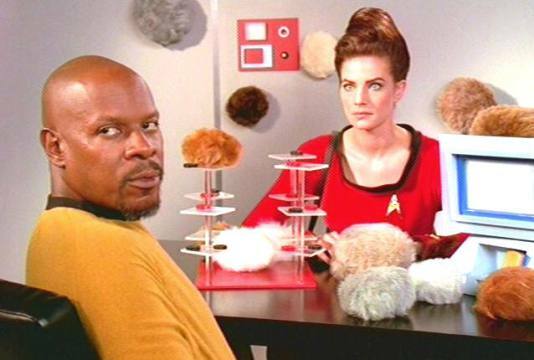 “Trials and Tribble-ations” — DS9’s 30th anniversary episode, utilizing “Forrest Gump” technology to intersperse the DS9 characters in TOS’s “The Trouble with Tribbles”. DS9’s best comedy and a great callback. Avery Brooks and Terry Farrell take a break from filming to watch Voyager’s “Flashback” — and wonder yet again what their sister series is thinking. “Things Past” — Another fascinating look back at DS9 before the series started. Sort of the sequel to “Necessary Evil”. 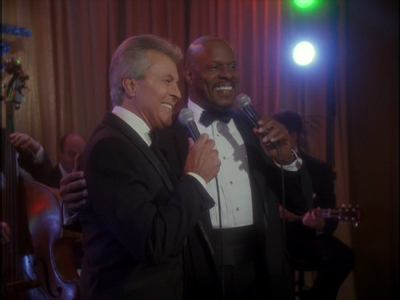 “Rapture” — The best of the Sisko/Emissary episodes. We almost included it in the tapestry, as keeping Bajor out of the Federation likely saved the planet during the Dominion War. “In the Cards” — A sort of lead-in to the series-altering “Call to Arms”. It’s the best use of the Jake/Nog combo that we saw a lot early in the series and is genuinely funny in a low-key kind of way. 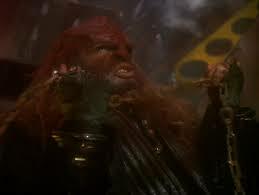 “The Siege of AR-558” — Easily DS9’s hardest-core combat episode. Hell, Nog loses his leg! 10. “Rivals”/”Melora”/”Second Skin”/”Cardassians” — A stretch of episodes early in season two that made the series seem very aimless and boring. Things picked up with “Blood Oath” and then with the great “Maquis” two parter. 9. 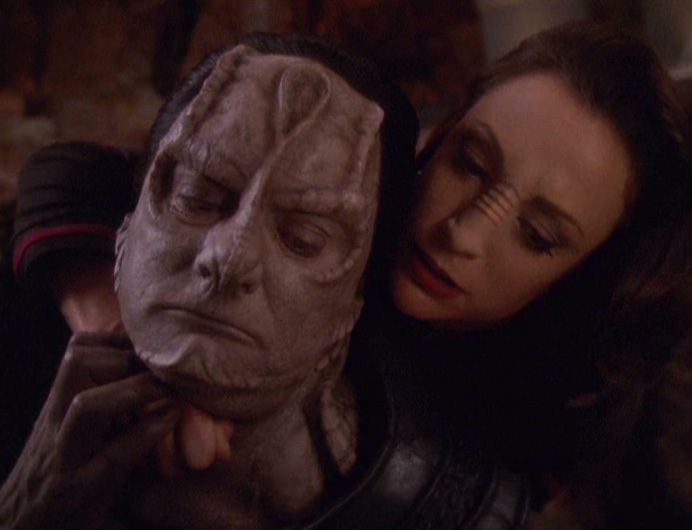 “Wrongs Darker than Death or Night” — Perhaps DS9’s weirdest episode as we get a ton of retconning — turns out Dukat and Kira’s moms were lovers 20 years earlier?! — and some very odd and questionable use of time travel. It’s not unwatchable, but it seems like an idea that should have been scrapped or reworked. 8. 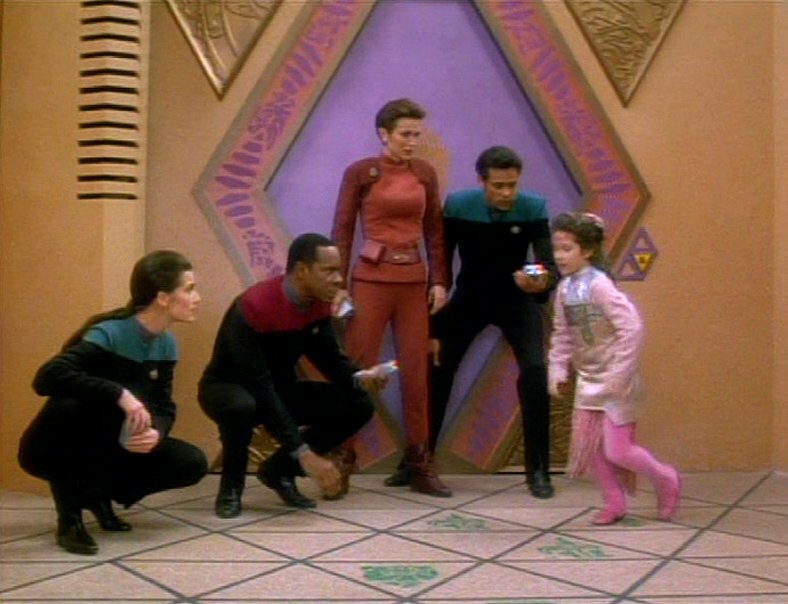 “Move Along Home” — Sisko, Kira, Dax and Bashir get trapped in a board game. It’s almost a TOS homage, but in the way you wouldn’t want to do a TOS homage. Think “Gamesters of Triskelion” for the 1990s. Allamaraine, count to four; Allamaraine, then three more; Allamaraine, if you can see… this episode then I feel very, very sorry for you. Sisko’s falsetto is not to be missed! 7. “Playing God” — Part of the boringness in season two mentioned above, Dax works with a Trill initiate in the worst example of lame Trill episodes. Also, compare serene, above-it-all Dax from season one with what we see in this crapfest. 6. “The Emperor’s New Cloak” — Not as unwatchable as some on list, but simply inexcusable given that it was the final chapter in the mirror-universe subset and that it’s so contrived, ham-fisted and ridiculous. “Remember what Captain Sisko once told us … ” Yuck. 5. “The Muse” — Something about Jake and an alien who draws energy from him as a writer and a weird Lwaxana subplot. Honestly, it’s probably DS9’s most boring episode and I don’t remember what happened that well because I might have watched it twice. 4. “Let He Who is Without Sin … ” Worf, Dax, Bashir, Leeta and Quark go to Risa — and Worf commits an act of terrorism (oh, please) in aiding some weird fundamentalists. 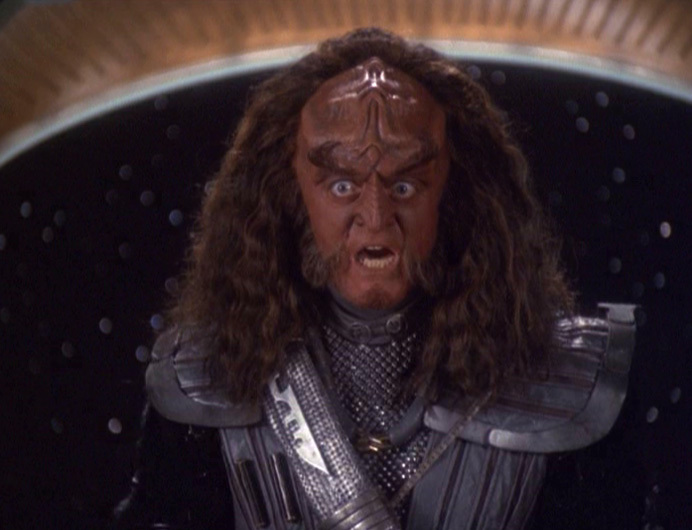 If not for one halfway decent character moment for Worf, this would have easily gotten the bottom spot. 3. “Take Me Out to the Holosuite”/”Badda-Bing Badda-Bang” — Sisko, in the middle of the freaking war, trains the entire senior staff to beat Vulcans at baseball. A few months later, the senior staff spends a bunch of time — IN THE MIDDLE OF THE FREAKING WAR — to save hologram Vic Fontaine. 2. “Ferengi Love Songs”/”Profit and Lace” — Awful Ferengi equal-rights nonsense with secret lovers and cross-dressing. Bad creators. Bad. 1. “Fascination” — Lwaxana Troi makes everybody all horny. Really. It’s an episode. 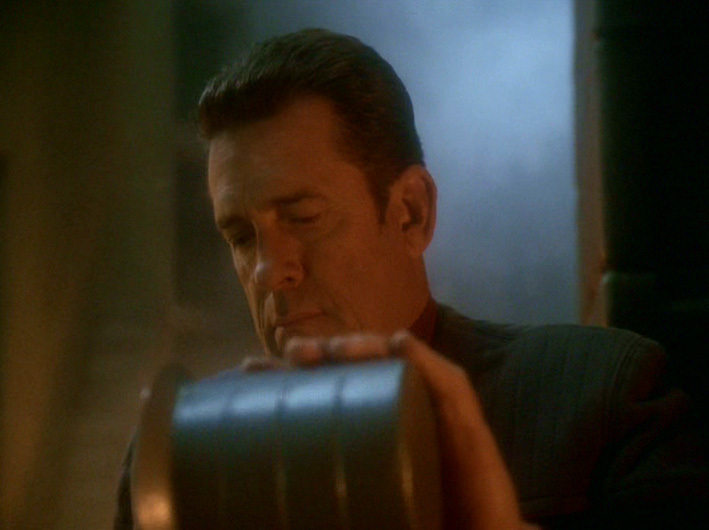 Worse, it’s an episode in season three, at a time when DS9 was STARTING to really get rolling. “Far Beyond the Stars” — I know that this is a much-loved outing and I give the creators credit for the attempt. But the characters in it are SO over the top, the squabbling is SO relentless and Avery Brooks is just SO bad in the Benny Russell meltdown scene (“It’s in — my MIND!”). Don’t get me wrong, it’s not a terrible episode. But if blows my mind (my MIND!) that it’s on anyone’s top 20 list. Voyager. Assuming there are any shuttles still left to get us there. Hope you like CGI ships getting blowed up! 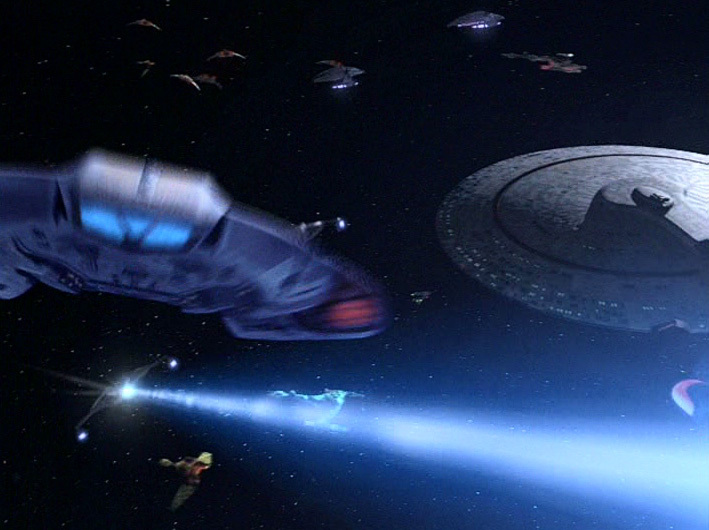 The DS9 crew, aboard the new Defiant, sets out for Cardassia as part of a huge allied fleet set on ending the war. Back on Bajor, Dukat (still appearing as a Bajoran) has his sight back and returns to Kai Winn, who has discovered how to release the pah-wraiths from the fire caves — and was waiting for his return to do it. Meanwhile, the Dominion learns Damar is alive on the streets of Cardassia Prime, fomenting rebellion. After Damar’s forces cut power to Dominion headquarters, the female Changeling goes bonkers and starts killing Cardassians indiscriminately. This prompts Damar, Kira and Garak to mount an assault on Dominion HQ. By this point, the Federation and its allies have pushed the Dominion and Breen fleet back into the Cardassian system — as the Cardassian ships have switched sides. 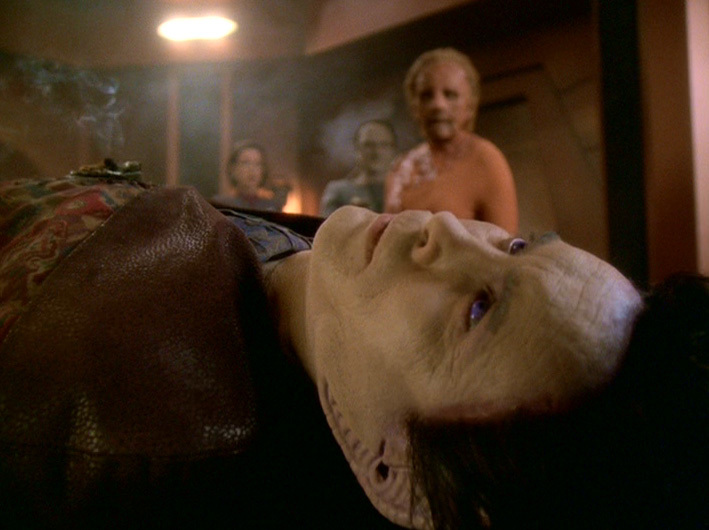 As Damar’s party gets into Dominion HQ, Damar is killed — but Kira and Garak capture the female Changeling and Garak kills Weyoun. 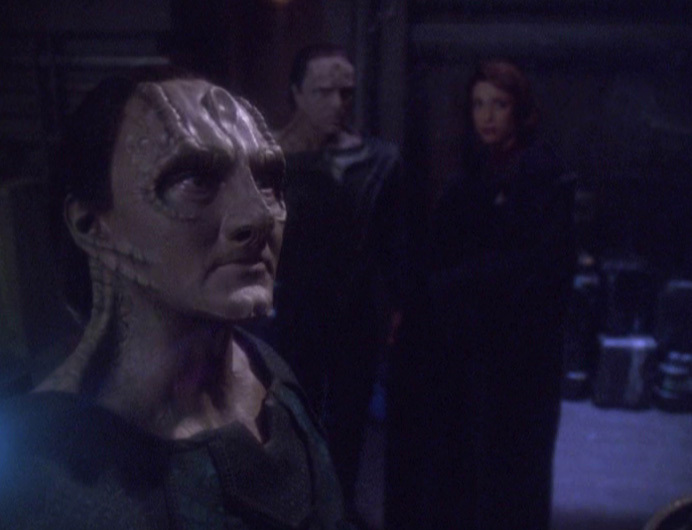 The female Changeling refuses to surrender, telling Kira that the Jem’Hadar and the Breen will fight to the last man. 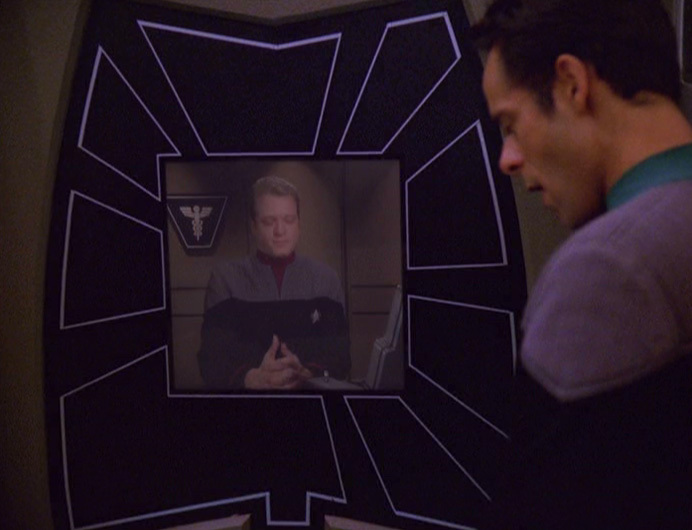 Kira sends a message to the Defiant, and Odo beams down to talk to the female Changeling. He links with her, she surrenders, and he cures her of the disease and promises to take the cure to the Great Link (as she is likely facing jail time for war crimes). Odo also tells Kira that he’ll be joining the Link for good. There is… another… Weyou… No there’s not! With 800 million more Cardassians killed, the war is over, and the papers are signed back on DS9. Worf becomes Martok’s Federation ambassador, Odo will go back to the Great Link, the O’Briens get ready to head to Earth so Miles can be an instructor at Starfleet Academy and Sisko and the gang have one last night out at Vic’s. On the dance floor with pregnant Kasidy, Sisko realizes he must head to the fire caves and stop Dukat and Winn. An empowered Dukat nearly defeats Sisko, but with a dying Winn’s help, he’s able to grab Dukat and fling both of them into the flames. The pah-wraiths are forever trapped and the Prophets save Sisko — but he must stay with them for an unknown amount of time. When the crew can’t find Sisko, he returns briefly and tells Kasidy he has to leave, but that he will return, “in a year … or, maybe, yesterday.” Worf and O’Brien leave and Kira returns from taking Odo to the Gamma Quadrant. Back on the station, Kira’s left in command, with Quark still at his bar, Nog a newly minted lieutenant and Bashir and Ezri a happy couple. The series ends as Kira hugs a mournful Jake while he looks out a window on the Promenade toward the wormhole. As the final episode of Trek’s most serial show, a lot of things happen. The war ends, Cardassia lies in ruins, peace returns, the pah-wraiths are banished, Dukat, Damar, Weyoun and Winn all die, Odo returns to the Great Link, Worf heads to the Klingon homeworld, Garak returns to Cardassia, O’Brien leaves for Earth and Sisko essentially becomes a god. In other words, a lot of ground was covered here. Say one thing for DS9, it didn’t pull punches and closed NEARLY every open question in a whirlwind of a final two hours — and a final eight episodes. The absolute most disappointing thing that the creators botched would have been a character moment. It’s simply inconceivable that Sisko wouldn’t say goodbye to Jake. It was a poor decision not to have a final moment with Kasidy AND Jake. The bond between the Siskos was one of the things that series got right from day one, and to not do it justice in the final episode was simply terrible. Remember that “The Visitor” — in which Jake must deal with Sisko’s sort of death — is widely considered to be DS9’s best episode. There are some other odd things about this episode — some of which seem like they might have been editing issues. Some of them have to do with the timing of events — particularly in concurrence with “Star Trek: Insurrection”. After the war is over, negotiations commence and the female Changeling signs the treaty. Then, Sisko gets wind of the fire caves thing that’s happening and heads to Bajor — where Winn and Dukat are just wrapping things up. 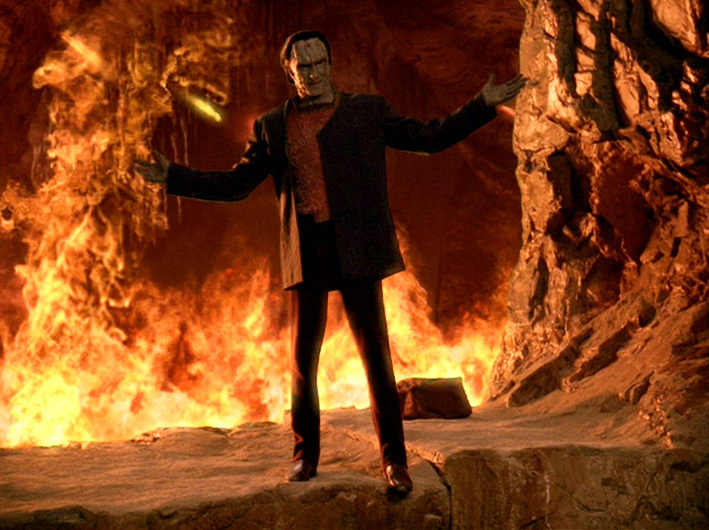 I’ve got to ask — how long were Winn and Dukat in the fire caves? Based simply on the events of this episode, it had to be at least a couple weeks. That seems just impossible. And other events in Trek make this botched sequence EVEN WORSE. We didn’t review “Star Trek: Insurrection” as it’s a pretty inconsequential movie based on our site guidelines. But Worf’s presence on the Enterprise-E in that film is sort of explained by hinting that the Dominion and the Federation are negotiating a peace treaty while Worf’s away. So, in other words, Dukat and Winn are in the fire caves as the Federation fleet gets to Cardassia, battles the Dominion forces, gets the female Changeling to surrender and returns to the station — and while Worf has a zorch and a fun adventure with the Enterprise-E crew. 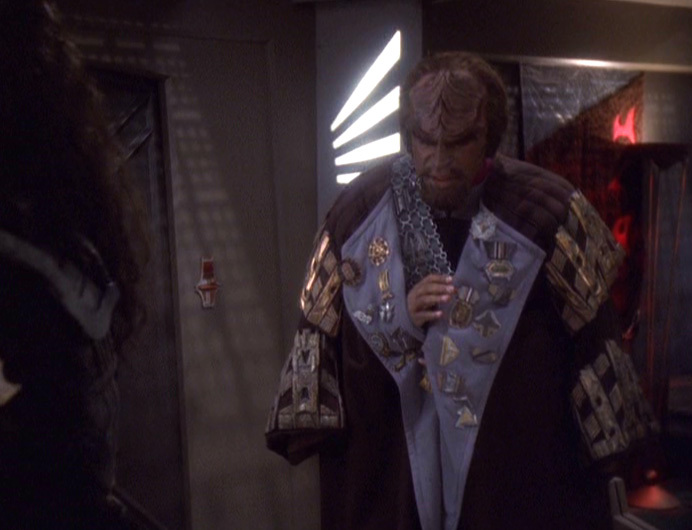 Worf is present for the treaty signing and he heads off with Martok afterward. So, it’s really not a stretch to think that Dukat and Winn were in the fire caves for like a month! There are easy ways this could have been fixed, BTW. Winn, after sort of banishing Dukat, could have decided to go to the fire caves AFTER the Federation won the war — possibly because she thought she’d never have another chance to undermine Sisko. The pah-wraiths could have had something to do with the timing, too. Or, even better, Worf could have joined the Enterprise-E crew after leaving DS9 but before officially taking over as Martok’s ambassador. But, as it stands, the only conclusion one can draw is that Dukat and Winn were in the fire caves for at least two weeks, probably much longer. And that is just implausible. Last minor gripe: The creators also seemed to forget one of the original points of DS9 — getting Bajor ready for Federation membership. This could have been EASILY covered by a line of dialog in the finale’s final moments about Kira getting ready for a ceremony about Federation admission. The scene with Nog and Kira in Sisko’s old office would have been perfect. Instead, that matter is left entirely unaddressed. Weird. OK, so the timing issue clearly bothers me a lot. I think it’s because “What You Leave Behind” was ALMOST so freaking good — and where it was bad, it was bad in places that were SO easily fixable. There’s one other item that I’d put on the list of decisions that I disagree with — though it’s more of a weird choice than a bad one: It’s too bad that the creators didn’t let Damar live and become Cardassia’s new leader. Given everything he went through in the seventh season, it would have been a nice moment to see Damar thanking Sisko, Kira, et. al and telling them Cardassians everywhere owe the Federation and its allies their thanks. Showing a somewhat dystopian Cardassia Prime was an interesting choice — but it’s not the one I would have made. Flawed finale and all, DS9 still gets major points for its ambition, its acting and its continuity. While it’s not the most popular Trek series and is even considered a black sheep by some, it was the only Trek show other than TOS that could be considered ahead of its time. Comparing DS9 with “Breaking Bad” or “The Wire” is not a stretch — though the latter two series are, obviously, superior. Compare Voyager with either of those series, and, well, your back might give out like mine just did. DS9 wasn’t perfect. It had too much Ferengi crap, it was very hit-or-miss until late in the second season and it often bit off WAY more than it could chew. But, it’ll always hold a special place in this Trekkie’s heart. A final look at DS9, before we get into Voyager country. Part one: Odo’s back on DS9, and he’s not doing well. 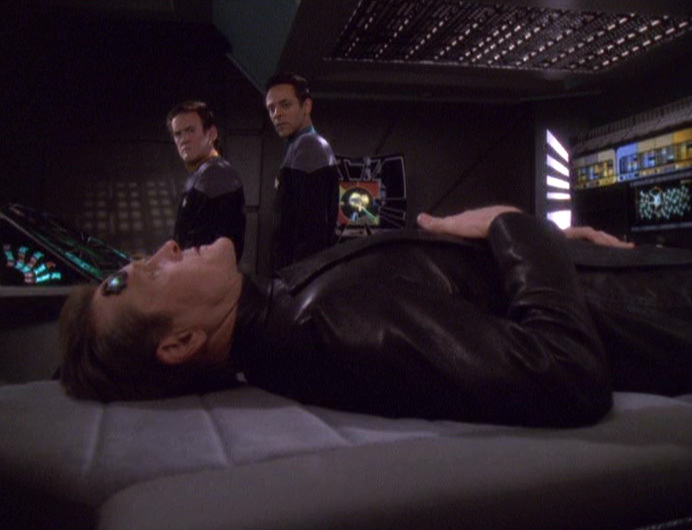 Bashir and O’Brien, acting on their plan from “Tacking into the Wind”, lure Sloan (William Sadler) from Section 31. Once they capture him, he triggers a suicide implant, so Bashir and O’Brien use Romulan mind probes to enter his dying mind — which, conveniently, looks like DS9 — to see if they can find the cure to the Changeling disease (bah). The plan generally works, through a bunch of Voyager-style nonsense. But Bashir has to choose between getting all the secrets of Section 31 from Sloan’s mind or escaping in time to save Odo. Or something. What a mess of an episode. Part two: Kira, Damar and Garak take their stolen Jem’Hadar ship to Cardassia Prime for a meeting with some Cardies who say they want to join the rebellion, but it’s a trap, the Jem’Hadar ship is destroyed and the trio must hide in Garak’s childhood home, which had belonged to our old buddy Enabaran Tain. Shortly thereafter, they learn that the Dominion has destroyed all of Damar’s bases. With few other options, Kira, Damar and Garak take the rebellion to the streets. Back on the station, Odo’s cured and is informed that Section 31 infected him way back when to infect the other Changelings — and that the Federation Council is unwilling to share the cure with the Dominion. Oh, and Sisko gets a new Defiant-class ship, which is renamed to honor the ship destroyed earlier in the arc (and allowing existing sets and optics to be used!). At the same time, Grand Nagus Zek (Wallace Shawn, whom we first met in “The Nagus” but who has showed up in numerous Ferengi nonsense episodes) contacts Quark, through a garbled transmission, and tells him he will be the new Ferengi leader. Zek then shows up on the station and tells Quark he actually wants Rom to be the new Nagus (see the garbled transmission above). 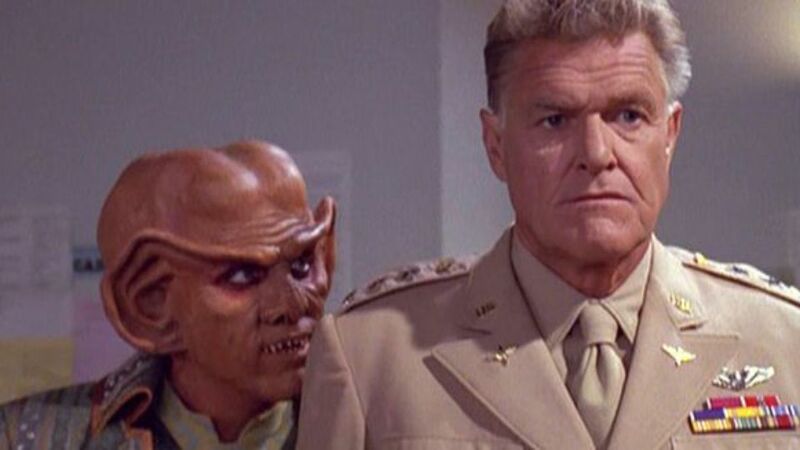 With Ferengi culture becoming more human, Quark pledges to keep his bar a staple of Ferengi tradition (meh). The episode ends as Sisko, Ross and Martok discuss strategy now that the Dominion and the Breen are pulling back as the Federation can now defend against the Breen weapon. The Federation alliance decides to go on the offensive, in hopes of finally ending the war. As DS9 draws closer to the end, the plot summaries sort of explain the significance of the episodes. The Dominion pullback is the biggest domino here, as that emboldens the Federation and its allies to try to stick a fork in the fighting. But getting the cure to the Changeling disease is actually a huge domino, as we’ll see in our next review. Without the efforts of Bashir and O’Brien, it’s likely the war would have lasted a lot longer — as we’ll see. We also see the end of the Ferengi storylines (mercifully). While the Ferengi characters would often be well used in places (like Quark and Rom’s role in and around “Sacrifice of Angels”), one of DS9’s biggest failings was the thinking that at least two episodes a year had to be Ferengi-dominant, resulting in some of the worst showings the series produced. So, while it’s pretty laughable that the Nagus would have enough power — and enough desire — to change the entire Ferengi culture, apparently based on his experiences in the past seven years, it’s also sort of appropriate. And it’s a big deal. In the span of about four episodes, DS9 will change the ruler of three major Alpha Quadrant entities — the Klingon Empire, the Cardassian Union and the Ferengi Alliance. “Extreme Measures” is just a terrible, terrible episode. Colm Meaney and Alexander Siddig do what they can, as usual. But the premise and the execution are just awful. Sloan’s mind looks just like DS9? Please. Sloan has the exact formula for the cure to the disease affecting the Founders memorized? Ridiculous. Bashir and O’Brien do all of this unsanctioned (aside from some limited notification of Sisko)? Stupid. It’s too bad, because the Bashir/O’Brien friendship was a real strength of DS9, so it’s hard to figure what the creators were thinking on this one. It frankly comes across as low-rent and trite — a combination of TOS budget limitations and Voyager nonsense. “The Dogs of War” is a better episode, but so much happens in it that it’s kind of a blur — and it doesn’t even get into the Dukat/Winn stuff. Frankly, the creators’ decision again to shoehorn the Ferengi into stories hurts things. It’s also unfortunate that the creators decided that the Ferengi should evolve to be more like humans (and in a ridiculously fast way). I remember watching this episode in 1999 and thinking that somehow, Rom would bring a bunch of Ferengi ships to help the Federation in the series finale — which would have made what happened here a stronger story. But, of course, that didn’t happen. Instead, it’s just more bad-comedy drivel — even if Max Grodenchik puts in a nice performance in his last outing as Rom. These two episodes are probably the weakest in the final arc so far, though “The Dogs of War” isn’t really awful. The finale, of course, has some issues — but we’ll get to that later this week. The finale. Duh. I just said that.